Today, artist and Moral Monday activist Bibi Bowman spoke at the People’s House addressing the mainly pragmatic GOP dominated North Carolina General Assembly as an artist who supports Public Education and inclusion of the arts. Her message is for all of North Carolina. The arts are the soul of a society. The arts are the very soul of any society. Let us pause for a moment to consider the future of our soul. Our collective soul. John Adams, one of our founding fathers, studied politics and law, so that his children could be engineers and architects–in order for their children to be able to study the arts. I am an enthusiast on the subject of the arts. but it is an enthusiasm of which I am not ashamed, as it’s object is to improve the taste of my countrymen, to increase their reputation, to reconcile to them the respect of the world & procure them it’s praise. America was indeed founded by visionaries who held the arts in the highest regard. Creativity and innovation are what make America exceptional. Nurturing creativity, celebrating creativity, is central to what it means to be American. Nurturing and celebrating creativity from early childhood all the way through school is what burgeons forth in some of us–and make no mistake, we all know we excelled in some subjects more than others, and we all knew somebody who was just particularly gifted in something but not another–but nurturing and celebrating that artistic creativity from childhood on up through school is what burgeons forth in some of us as entrepreneurial innovation. Humanities and the Liberal Arts in public education will improve the economy. All children are born artists until somebody either lets them forget it or, worse, squelches their creativity. They only need nurturing and celebrating to continue to flourish, and arts in education is where that happens. Public Education for all children empowers everybody’s baby! RELATED: In Their Own Words: The Purpose Of The Moral March In Raleigh. China has been jealous of our school system since back in the nineties, studying it, and trying to emulate it. America files more patents per year than anywhere else in the world. Yes! Not a few more. Not twice as many. I mean many, many times over the numbers filed elsewhere, including China, in spite of China’s gigantic population. So, China is envious and wants to catch up by emulating the type of education system the United States had been employing up until about 2002, which was thickly laden with healthy doses of the arts. Creativity And Innovation, Making America Exceptional. Research team at Duke and Harvard surveyed 652 heads of product engineering at 502 technology companies. 2% percent held them in Mathematics. The rest have degrees in fields as diverse as Business, Accounting, Finance, Health Care, Arts and the Humanities. As a product of public schools in the state of North Carolina from kindergarten right through the East Carolina University School of Art, and as a working artist now these 35 years later, naturally I have pretty strong feelings about the fabulous value of public schools, and particularly the involvement of the arts therein. I cannot over-emphasize the importance of Public Education for all children; because public education empowers everybody’s baby! I assert that all art, any of the arts, literature, dance, music, theatre, painting, all art boils down to one thing: Communication. A message. A story. Something you need to say. An audience. A recipient. A target for your message. A vehicle. A means of transmitting this story to that audience. There is always room to debate whether a particular message is worthy, or whether an audience is receptive, and whether the right vehicle for that communication is selected, and of course then comes craftsmanship. What I can personally say is that if I am not actively communicating through what I do, I cannot in good faith claim I am doing art. Maybe it’s just craft. I, Bibi Bowman, paint because it is my most effective way to communicate my thoughts, feelings, experiences, opinions, and stories. When I was small, my dad told me that everyone who enters this world, even if for only a minute, or for a whole century, makes a difference, and leaves his mark; what you have to do is to pick the best crayon out of your bucket and make your mark beautiful. You can’t help it, an artist’s duty, as far as I’m concerned, is to reflect the times. My own mission, although art is often said to be a reflection of reality and of truth, is to choose deliberately to seek out the beauty in reality and truth no matter how inobvous it may be. The beauty in reality and truth no matter how inobvous it may be. My goal, therefore, is to leave the world at least as nice as I found it, and as far as I’m able, I hope to leave it somehow better for my having passed through this place. I think about the collective soul of our society, the arts again, of course, as I started off saying, and how our founding fathers revered the arts. I think about all the civilizations that went before ours. Greek, Egyptian, Incan, Mesopotamian. And all we know of them really is the art that survived. I imagine some distant future when I’ll have been gone a long, long time, and all of us are forgotten along with politics and the rest, when what is dug out of an archeological excavation to show what was our society of today about, and what they find is art. I hope they find beauty. An artist cannot speak about his own art any more than a plant can discuss horticulture. And it’s true. Painting is my usual vehicle, and I believe if a painting needs more words than a title, it should be prose instead. Or interpretive dance. So here I have some pieces of mine to show, or go look on ArtSouth.us, where my serious pieces of the Working Class are shown. RELATED: Grandmother Spends Moral Monday In Jail, A Birthday Present For Her Grandchild’s Future. And that power wielded by the arts is a treasure worth cultivating. Bibi is a grandmother, a mother, a daughter, and a descendant of lines of ancestors who have been natives of the North Carolina territory since before the Revolutionary war. 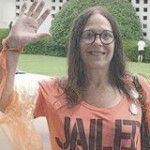 She is passionately involved in the Moral Monday movement. All my articles.